Every time I get to premiere some guitars, a metallic tear of joy sheds from my eye. Luckily for me, I have colleagues like Harold Gutierrez whom keep the metal projects coming at a fierce and unrelenting pace which the genre would approve of. 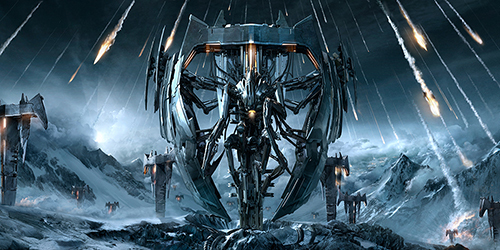 I swear, I just clicked send on my Amon Amarth invoice, when Harold shot me over the unreleased artwork from the upcoming Trivium release, “Vengeance Falls.” Invasion of earth by Trivium “T” shaped ships which open into metallic praying mantis robots? Check. What Harold didn’t know, is that I’ve been watching an unhealthy amount of X-Files, Aliens, and Prometheus, and what was supposed to be an exploratory call turned into me nerding out about the various aspects of “making contact” with the unknown and all the 80s era futuristic interfaces that go with that. Programming began by working out the tech of two mobile experiences running simultaneously, as we provided visitors two options for syncing a mobile device to their desktop browser: Telephony Call (if they were in US, CA, UK, DE) and Mobile “Web App” Pairing. This will be referenced throughout this case study as “Telephone” or “Mobile Web App” respectively. Regardless of the path that was chosen, we required a unique ID to represent the user and we needed to store that ID somehow on both clients. If the visitor chose to be called, they simply input their phone number into a form the desktop website, which would asynchronously run a Twilio call request on the server using the Twilio-Ruby gem. Visitors who could not participate in the phone syncing were provided a code which they could enter on the mobile web app version of Trivium.FM to complete the pairing process. This was done simply by provisioning the Heroku RedisToGo addon and continually incrementing a “code_count” integer on the server as needed. This was also sent to the client using JSON and stored locally. With our mobile devices synced to our desktop browser, our next step is to send the noisy transmission Trivium provided on each of our mobile experiences. As soon as a call is placed, Twilio runs the following TwiML application which plays the transmission back and begins to gather key presses which will be used in the controller explained later. r.Say "Use your phone's number keys to navigate the invasion." Note that the audio provided should be lossless because MP3 files will take longer to transcode and potentially sound worse. I usually provide MP3, OGG, and WAV for maximum compatibility. Of course, sending the transmission is only 50% of the experience. So as soon as the mobile device is synced and sending, the desktop browser should begin interpreting the incoming transmission using a bit of smoke and mirrors and a lot of Dancer.js. The after event will fire continuously as soon as the track begins so I use it to draw my waveform line using Kinetic.js by defining a new array of points given the value of the provided waveform data and drawing a Kinetic.Line with those points. Dancer.js kicks are used to detect peaks in frequency (or heightened points in the track) and I’ve used it to begin teasing the Invasion artwork simply by adjusting the opacity of that layer given the magnitude provided. You can also use the library to fire an event onceAt a specified time, which is perfect for lyrics visualization and could be expanded to show various changes in the experience around major track sections. Finally, the same sound is loaded in various formats, the volume set to mute, and is played back. Once mobile has transmitted the message and the desktop browser has interpreted it, the invasion artwork is faded in and the mobile device is now able to control the artwork’s position because we still have our synced connection in place. Let’s take a look at how this is achieved differently within a call and the mobile web app. Since we can’t exactly do anything “visual” within a phone call, we’ll need to turn our Keypad into a 9 axis controller. Earlier we saw that as soon as the audio is played back, we begin gathering key presses. These are sent to a gather function which loops continuously, listening for key presses and sends those to the desktop browser in real-time using Pusher. The desktop client then translates the numerical key press to a CSS position which is passed using jQuery to the Invasion artwork div. when 1 then "top left"
when 2 then "top center"
when 3 then "top right"
when 4 then "center left"
when 5 then "center center"
when 6 then "center right"
when 7 then "bottom left"
when 8 then "bottom center"
when 9 then "bottom right"
Throw in a bit of CSS3 transitioning and you’ve got a smooth artwork explorer. I then listen for clicks on these buttons and pass the corresponding key values over to the same Pusher client event listening for key presses. Note that in both of these examples, we’re passing the unique ID we established earlier (as code or call) to make sure these are being fired on the appropriate client. The response to this campaign was amazing, leading to something like 200 million Pusher events, thousands of phone calls, and critics asking themselves, “Who do Trivium think they are, Jay-Z, using a mobile phone to deliver music?” Fans were also compelled enough to record the experience on YouTube, which I especially enjoyed, because it shows off all the initial bugs. If I had to summarize what impressed me most about this campaign, it’s that the entire concept came from one image which we developed a storyline around over a single phone call. We we so happy with how Part 1 went, that we quickly flipped the website into Transmission 2 and premiered the whole Brave This Storm track using some heavy visual lifting by HTML5 canvas. Don’t bet your whole campaign on a singular idea. Instead break your experience into interesting bite sized segments you can analyze and roll out over the length of your cycle, subscribing emails along the way. Part 3? You’ll just have to sign-up, wait, and see. As always, thanks for reading. Drop me a line on Twitter or over email if you have any questions or comments.